Click here to contact us! Click here to contact us! Click here to contact us! has specialized in designing and manufacturing outdoor leisure products 10 years . The company has a plant area of over 10,000 square meters and over 200 employees so far. 5. we have more than 6 years of export experience. Based on our experience, with our reasonable price, high quality and considerate service. Our products enjoy the high reputation in our market. Enterprise talent: Faithful, professional, aggressive. 1.Features 7075 aluminum alloy holder, ultra-light and durable. Portable and lightweight, only weigh as a bottle of mineral water. Can be put in a small and ultra-light bag, easy for carrying and storage. 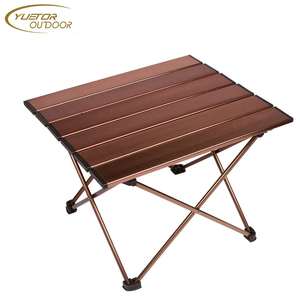 Xiamen Xinhuxia Hardware Industry&Trade Co., Ltd.
Guangzhou Izumi Industrial Co., Ltd.
- W82 x D163 x H73 cm (open) W82 x D10.7 x H49 cm (folded) - Net Weight: 10.5 kgs - Gross Weight: 11.6 kgs BBQ Table Set OW-122Q Octagon BBQ Table - Aluminium frame and tubes - Vaneer tabletop. - L153 x W48 x H180 cm (open) L50 x W16 x H77 cm (foleded) - Net Weight: 6.3 kgs - Gross Weight: 8.5 kgs OW-150B 3-Folding L-BBQ Table - Titanium - Aluminium frame and tubes - 2-Level table height. -L100 x W57.5 x H66.5 cm (open) L16 x W16 x H100 cm (folded) - Net Weight: 4.3 kgs - Gross Weight: 5.2 kgs OW-12 Wing Table - Aluminum Frame and roll table top. Jinhua Reliant Economy & Trade Co., Ltd.
Jiangsu Winwin Metal Product Company Ltd.
Hangzhou Flew Leisure Products Co., Ltd.
Xiamen J-Goode Leisure Products Co., Ltd.
Two Mesh Cup Outdoor Beach Camping Foldable Table table with fabric top deploys easily to provide convenient, off-the-ground space for quick snacks or main meals. The two mesh cup holders keep beverages secure and close at hand. Lightweight, portable and pack-able, The table sets up quickly to provide a wobble-free table top, and break down is just as easy. Our camping sets include smart features to make outdoor sport easier and a lot more accessible. 2.The camping chair and table set is made of durable and brightly colored polyester fabric with water-proof. At present, we have a group of skilled workers and an entire set of strict control examination systems. Pinghu Huayang Outdoor Goods Co., Ltd. The aluminum table legs can then be folded toward the center and stored away. This makes the outdoor metal table the perfect grab and go table for any outdoor adventure. The ruggedness of the aluminum outdoor table allows you to enjoy it in any outdoor setting you're in. 2)Made by stainless steel, easy to operate and clean,stable performance. 4) Indirect heat transfer by glass,produce little ash and smoke,more environmental protection. Products exported to all over the world expecially the USA, Europe, Australia, Korea, and so on. 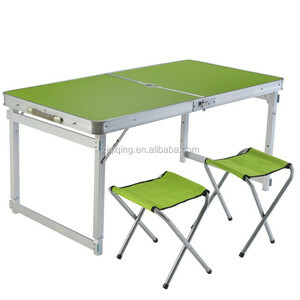 Alibaba.com offers 80 all weather mdf top folding picnic table products. There are 0 all weather mdf top folding picnic table suppliers, mainly located in .